Teff is a small grain, perhaps the world’s tiniest, but it packs a powerful nutritional punch. A staple throughout Ethiopia, it is often referred to as the “runner’s superfood” given the wining tradition of marathoners from this country. The off-season is a great time to try new foods, recipes, and expanding your variety of whole grains exposes you to a broader spectrum of nutrients, as well as provides carbohydrate fuel for your training. 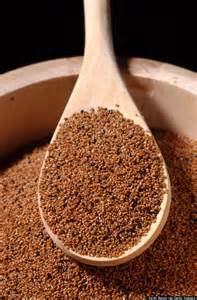 Teff is high in iron, an important nutrient for endurance athletes for it’s role in providing oxygen to exercising muscles. If you have celiac disease or non-celiac gluten sensitivity, it is gluten free as well. Teff can be used to make bread, a creamy porridge, and in pancakes and crepes. Oldways has a recent article on teff that links to several recipes using this unique grain.